Two guys behind PJ talking: "Look it's a plane, no, it's superman, no, drat, just a cloud." Two Guys looking up: " Damn, if that cloud doesn't look like, oops never mind, just a fly on my glasses." PJ to Sean: "Hey, Sean, did you hear that David wanted to play your part and have the girls chase him around the sets?" Sean: "Where are these girls? I wanted to do some chasing!" 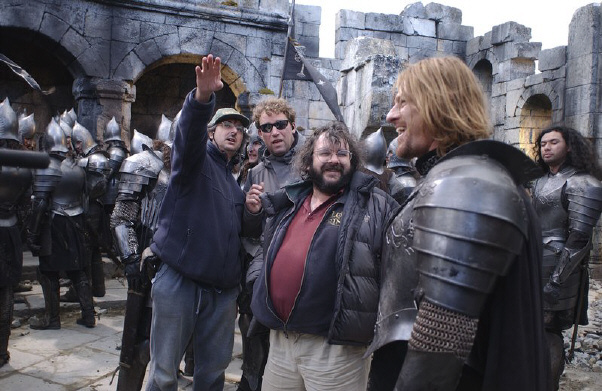 Andrew: "And Sean will be hoisted up there so he can yell out Boromir's victory call from the top of the wall. " Sean/Boromir: "But I'm afraid of heights, especially since that Moria scene"
PJ: "Get into character, Sean. Don't let that little mishap where Orlando had to save you from falling over the edge get to you." ...then we'll catapult Sean over the ramparts into the crowd of screaming fans. Man in far right of picture: Hmmmm. I think I got in the wrong wardrobe line...I'm supposed to be a pirate. "Look, look, LOOK!!!!! Over there!!! "Blimey, I don't believe it - a fell beast." "Ah, you guys, you crack me up. They aren't real, and I'm *not* looking round." Sean: "You want me to climb up there, Peter? HAHA! As I am to die in the next take I would say that it is Not My Job, Man!"